The Purge is a sci-fi/thriller written and directed by James DeMonaco and stars Ethan Hawke, Lena Heady, Max Burkholder, Adelaide Kane, Edwin Hodge and Rhys Wakefield. The story is set in the America of 2022. Crime is practically non-existent and unemployment is at just 1%. The new founding Fathers of this new America have created a law that on one night each year all crime is legal. People can rob, vandalise and even kill with no repercussions. This is called The Purge and it lasts for twelve hours. During this time there are no emergency services available. Many of the richer more educated citizens use it to vent their racist issues and do what they see as cleaning up the streets by killing the homeless and those who are not making a contribution to society. It is believed by dispelling all their aggression on this one night of the year that people can repress it for the rest of the year. James (Hawke) and Mary (Heady) at one time could not even afford to pay rent but when James cashed in on the whole idea of The Purge and created ‘state of the art’ security systems the family became the most affluent in a neighbourhood full of suburban snobs. As the family settle in for this year’s Purge, a homeless African American runs through the streets screaming for help. James’ son opens the doors and lets the man in which is a big mistake as a group of psycho’s are chasing him and so begins the action of this home invasion tale. For me the best parts of this movie were shown in the trailer. You are led to believe this is an action packed home invasion tale but it was more of a metaphor for the greed, jealousy and racism that exists in America and also the greed and dishonesty that goes hand in hand with capitalism. I was quite disappointed as the idea behind this film of one day where all crime is legal was so fresh and new that DeMonaco really could have done a lot more with this script. 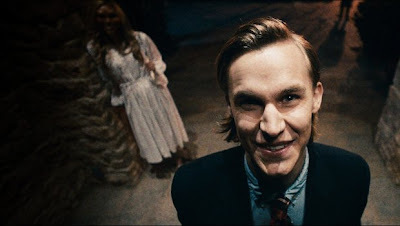 Rhys Wakefield played an excellent villain and I would love to see him develop this further in other movies. Over all this was just OK. It was missing the wow factor which I think many of us expected it to have. Do not go and see this with the high expectations I had or you will be disappointed. A miserable 2 out of 5.